In most areas of real life, endings can often be difficult. This can also be be true if you’ve created and produced a very successful television series that’s wrapping things up. In many of those cases, like withThe Sopranos and LOST, fans were very unhappy with the way those series ended. Mad Men creator Matthew Weiner doesn’t want his show to end like those and doesn’t want fans to end up disappointed. In fact, he’s already thinking about and planning the ending to his show. ”It came to me in the middle of last season,” said Weiner. “I always felt like it would be the experience of human life. And human life has a destination. It doesn’t mean Don’s gonna die. What I’m looking for, and how I hope to end the show, is like … It’s 2011. Don Draper would be 84 right now. I want to leave the show in a place where you have an idea of what it meant and how it’s related to you. It’s a very tall order, but I always talk about Abbey Road. Even as some networks are changing the way they provide programming to Netflix’s Instant Streaming service, the company is still managing to add programming as well. Case in point is the announcement late yesterday that Netflix is entering a new area of business. That business? Syndication. This new endeavor will begin with an exclusive deal between Netflix and Lionsgate to stream up to seven season of the Emmy-winning AMC TV series Mad Men. Under the deal, the first four seasons of Mad Men will be available on Netflix’s “Watch Instantly” service beginning on July 27. Additional seasons will be added as they finish airing on AMC. The announcement comes days after AMC announced it had made a deal to keep Mad Men on the air for three more years, bringing the total number of seasons to seven. 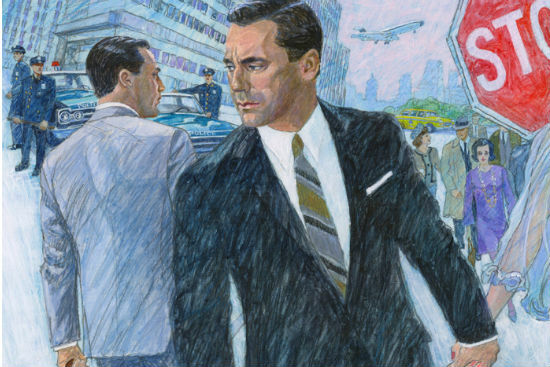 So, expect to see a lot more Mad Men for years to come. Seeing as the new season of Mad Men won’t debut until 2012, the new Netflix deal gives viewers a chance to catch up with all the previous episodes. See, who says you never get anything good on TV? With all the contract negotiations and such going on over at AMC between the network and the stars and creative team behind their blockbuster hit show Mad Men, there had been some speculation that a 5th season of the show wasn’t a done deal and if there’s going to be a 5th season at all. However, according to a Q&A taking place at the TCA sessions this week, and reported by Deadline, there is no deal yet with Lionsgate TV for a fifth season of the Emmy-winning period drama or between Lionsgate and series creator Matthew Weiner for him to continue on the show. However, according to the report, the plan is to bring Mad Men back for Season 5, AMC’s Joel Stillerman told reporters. But he was quick to point out that he din’t know exactly when. AMC President and GM Charlie Collier was also asked about the state of the Mad Men renewal. “We’re negotiating, don’t know much more than that yet,” he said. “Can’t put a timetable on if.” So, whatever that means it at least looks like AMC is planning on having the show back. Let’s hope all the pieces fall into place. As we do sometimes here at The Flickcast, we’ve got a video for you today that entertained and enthralled us enough to click a few buttons, type some text and share it with you. No, we’re not lazy,we just like to bring the best quality we can and don’t like to waste our time or your time. So, that brings us to this video made by YouTube user TVAuteur. In it watch as an animated character of Mad Men creator Matt Weiner conducts a job interview with a perspective employee. The video, to say the least, is pretty damn funny but also has a touch of anger — which we love. I just hope the guy who made it doesn’t end up getting sued. Of course, the real Mad Men airs on AMC Sunday nights. This video you can watch any time you want. In fact, how about right now after the jump? Some TV shows come and go and you wonder what happened or, in some cases, don’t really care all that much. Then, you watch a show like AMC’s Mad Men and you realize what great television can be and you count the months, weeks, days, hours minutes between the end of one season and the beginning of another. Fortunately, the wait for new episodes of Mad Men is almost over. To commemorate this event AMC has started to get the message out about the new season with the release of a new poster and some trailers. In the poster we see Don Draper (Jon Hamm) standing in an empty office overlooking the Manhattan skyline. Obviously, this is to suggest the theme (or at least one of them) for this coming season: that of starting fresh. This theme carries on in the trailers for the new season. Each of the characters get a fresh start at the new agency or in some other way and all of them look to be undergoing some big changes this season or, in the case of Roger Sterling (John Slattery) at least, back to his old ways: at least where drinking and smoking are concerned. Whatever happens in these trailers, and with the season, it’s just great to see these characters and the show again. That season premiere can’t get here soon enough. Check out all the trailers after the jump. Mad Men returns to AMC on Sunday, July 25th.